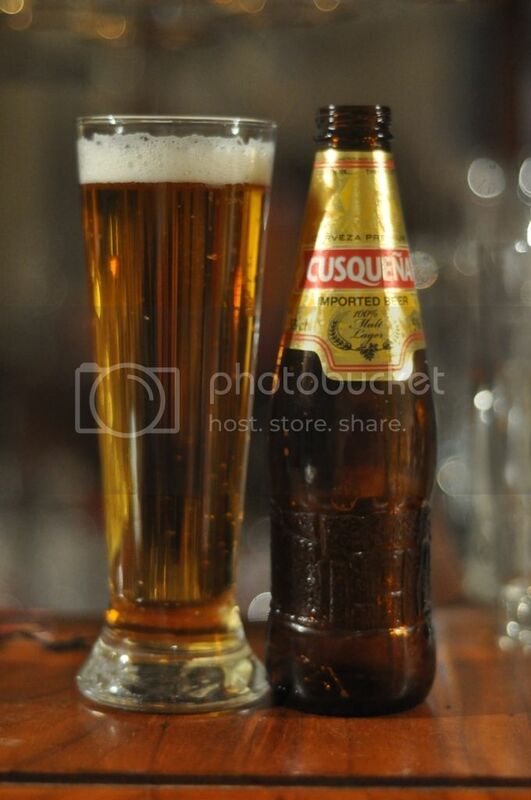 The beer of choice in Peru is Cusqueña. This is a 100% malt lager which is somewhat unusual, especially in South America. Peruvians struggle to adapt to more bitter lagers when they leave Peru and move overseas and this beer is the reason for this. Peru's beer industry is dominated by the Backus and Johnston brewery, now owned by SAB Miller. The competition to Cusqueña is mostly from the obligatory South American "Pilsen" beer. The bottle features an Incan wall design inspired by Machu Picchu and the Incan Empire. As cool as the bottle is it won't get repeat customers if the beer doesn't taste great, so let's drink this one. The nose is almost non-existent with only a very light aroma as the beer warms up. This is to be expecting from an all malt lager as they don't have the grain depth of other lagers. The beer claims to use 3 varieties of hops (Nugget, Styrian and Saaz) but I certainly can't detect any on the nose. Pleasantly there is no hint of skunkiness, which seems to be an ever-present in South American lagers. Cusqueña is a much better tasting beer than it looks or smells. Early in the palate the beer taste of only mildly sweet grains with just the tingly carbonation to excite the senses. This continues through the entirety of the beer which is quite unusual, with only a small hint of mildly bitter hops to change it up towards the end. The finish is crisp and dry and this quality would make this an excellent summer lager. As far as all malt lagers go this is one of the best. They are notoriously flavourless and not very pleasant, but this one is different. Cusqueña has a full malt flavour which is balanced out nicely by some mildly bitter hops. It's a refreshing beer that will quench your thirst in any situation. Not a world beating lager but a pretty solid attempt from Peru. It's an interesting lager that's worth a try if you can get your hands on some. Hi. Is Cusquena available in Oz now?? We've been waiting for it for a few years. I am in Brisbane. Do you know where we might source some? I don't know of alot of beer shops in Brisbane. Warners at the Bay in NSW stock it and deliver nationwide at a pretty reasonable rate. You may be able to find some closer to you if you call some specialty beer stores in Brisbane. Hope this helps.